No longer is Parliamentary procedure or City Council restricted to those who can physically be in the room; no more is 24-hour television news your only option for tracking the latest on election night. Say hello to real-time digital content. Social media and other live, real-time-updating technologies have changed the political process in many ways. That's what we're here to talk about. Join us for a live chat from 11:30 a.m.–12:30 p.m. ET with Nick Taylor-Vaisey of Maclean's magazine and Jon Gordon of Minnesota Public Radio, when we'll talk about how social media has changed politics and political reporting and how they are engaging with new audiences in new ways. Again, for some context while Nick and Jon prep their answers, a bit of information about the 2012 U.S. Presidential election. To combat this firehose of content, a lot of our clients pulled the most relevant social updates into liveblogs: updates from their reporters, from leading analysts, that first victorious tweet the re-crowned President sent out. The best coverage was tempered with longer posts with fact-filled analysis, high-quality multimedia and interactive polls and graphics, with Twitter merely a conduit to send readers to the site. We have a lot of committed commenters on our static content. They're never strangers for very long. Our realtime audience is much broader, and sometimes more thoughtful than your average commenter (no disrespect to the regulars!). One of the joys of real-time political coverage is watching readers say things that are actually clever or actually insightful, and not cheap shots or inane or racist or hateful. When we covered the federal cabinet shuffle in Ottawa earlier this year, among the mix of useless noise were a bunch of smart people we got to show off. An example: a reader commented on the party leadership ambitions of a cabinet minister, Lisa Raitt, who was promoted. We posted that, since Raitt hadn't been noted for gunning for the Conservative Party's top job. Days later, a national columnist wrote that Raitt might have such high hopes. Our reader published the idea first, and he was delighted to be credited. Sort of audience that engages in real-time content: I dunno, I wish I understood the audience a little more than I do. I have some guesses. But I will spare you my nascent thinking on that. I do know that when we pick the right events/stories to live-blog, they stick around longer. That's an important metric,. So true, Jon. I don't think there's any doubt that people want updates as they happen perhaps now more than ever. 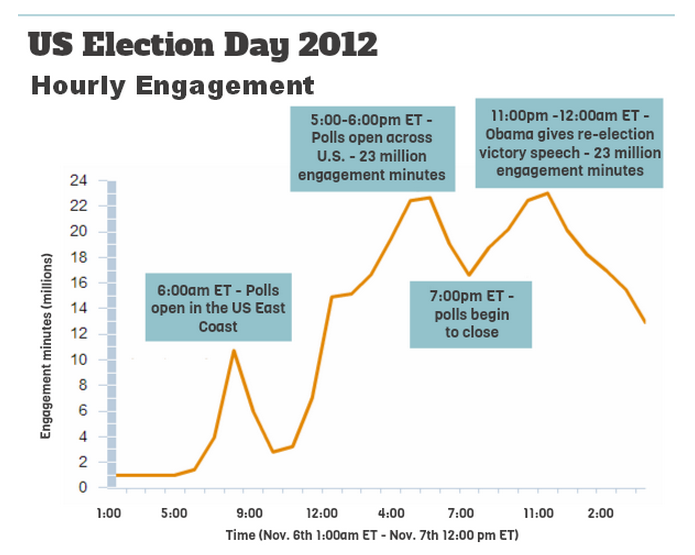 Check out this graph that tracked the amount of time spent on real-time content over the course of U.S. Election Day. I am also only speaking anecdotally about our real-time audience. I know very little about them, empirically. And I'm not sure the audiences are that different. I just think that, on the right story, a live blog can be a better way to cover a story. But we never do one at the expense of the other. We tend to view live blogs as a bridge to the story that our professional reporters will write later. I think you might be right about the audiences being not that different, Jon. I'm just impressed when real-time readers come up with smart things in real time, along with the rest of us pros. I feel like we've barely scratched the surface on this, but alas, our time is up.